Discuss how the relationships between the various classes of people aboard the Ibis change throughout the novel. To what extent does the caste system affect these relationships? Which characters undergo the most significant changes? How are women's roles different from men's in Sea of Poppies? What common ground do Deeti, Paulette, and Munia share? What does the Ibis represent to Zachary at various points in the novel? How does his perception of the ship change as his perception of himself changes? Many of the lives Ghosh depicts are shaped by social and political forces beyond their control. What are some of these forces? Describe some of the individual acts of bravery, defiance, or deception that enable his characters to break free from what they see as their fate. How do those involved in the opium trade, from British factory owners to frontline harvesters, justify their work in Sea of Poppies? How does their industry compare to modern-day drug trafficking versus the pharmaceutical industry? When Mr. Burnham gives religious instruction to Paulette, what does he reveal about his mindset in general? How does he balance his shame with his attitudes toward suffering, including his notion that slavery somehow yields freedom? Discuss the power of love as it motivates the characters. Does obsession strengthen or weaken Baboo Nob Kissin? What kind of love is illustrated when Deeti gives up her child? What kinds of love does Neel experience in the presence of his loyal wife and his fickle mistress? What gives Neel the ability to endure Alipore Jail and his subsequent voyage? Does he feel genuine compassion for his cell mate, or is he simply trying to make conditions more livable for himself? Ultimately, who is to blame for Neel's conviction? How did Paulette's free-spirited upbringing serve her later in life? What advantages and disadvantages did she have? What does Zachary teach Jodu about loyalty and survival? How is trust formed among the suspicious Ibis crew? To what degree is Mr. Crowle powerless? What does the future hold for those who defied him? Which historical aspects of the Opium Wars surprised you the most? What did you discover about colonial India by reading Sea of Poppies? Sea of Poppies makes rich use of Asian-influenced English. Some of the words, such as bandanna, loot, and dinghy, are still used frequently, but many others, like bankshall, wanderoo, and chawbuck, are now rare, although they were once common and are included in The Oxford English Dictionary. Discuss the Ibis Chrestomathy, which appears at the end of the book. What do Neel's observations suggest about language and culture? Why do you think some words disappear from usage, while others endure? Can a culture's vitality be measured by how eagerly its language absorbs outside influences? In an interview with TheBookseller.com, Ghosh stated that "oil is the opium of today." Do you agree or disagree? 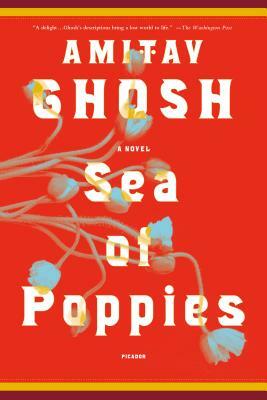 How does Sea of Poppies reflect themes you have observed in Amitav Ghosh's previous works? What new issues does he explore in this novel?